There are 12 Assisted Living Facilities in the Monroe area, with 5 in Monroe and 7 nearby. The average cost of assisted living in Monroe is $2,599 per month. This is lower than the national median of $3,346. Cheaper nearby regions include Loganville with an average starting cost of $2,483. To help you with your search, browse the 62 reviews below for assisted living facilities in Monroe. On average, consumers rate assisted living in Monroe 4.1 out of 5 stars. Better rated regions include Loganville with an average rating of 4.3 out of 5 stars. Located in Walton County near the Alcovy River basin, Monroe Ga., has a population of 13,000 with 12 percent of residents ages 65 and over. Assisted living facilities in Monroe, Georgia, fall under the authority of the Georgia Department of Community Health. These activities include eating, bathing, toileting, dressing and grooming. There are five such facilities in Monroe with 12 more residing in neighboring communities with an average monthly cost that closely mirrors the state average. The cost of living in Monroe is 15.1 percent lower than the national average. The majority of this difference is in local housing cost and would not benefit ALF residents. The costs of necessities such as groceries, health care and transportation are actually higher than the national mean. The climate in Monroe is comfortable but the weather is variable. Summer highs hover around the 90-degree mark and winter lows will just reach the freezing point. However, the humidity in the area can be extreme and severe thunderstorms in the spring and fall are common. Monroe does have a crime problem with violent crime and property crime rates being 48.7 and 68.8 respectively. These not only exceed the national averages they are worse than the numbers for Atlanta, the state's largest city. According to the EPA's National Air Toxics Assessment, the air quality in Monroe is slightly lower than the national average and shouldn't prove a risk to any but the most sensitive seniors. For a small city, Monroe has to a lot to offer to seniors with an artistic flare. The Monroe Walton Center for the Arts offers weekly adult classes, open studios, creative workshops and free creative gatherings year-round. There is also the Monroe Art Guild, which offers arts and crafts classes, oversees local art museums and hosts art films and lectures throughout the year. The Monroe area is home to world-class medical facilities, including the Piedmont Walton Hospital, in the event of medical emergencies or illness. Assisted Living costs in Monroe start around $2,599 per month on average, while the nationwide average cost of assisted living is $4,000 per month, according to the latest figures from Genworth’s Cost of Care Survey. 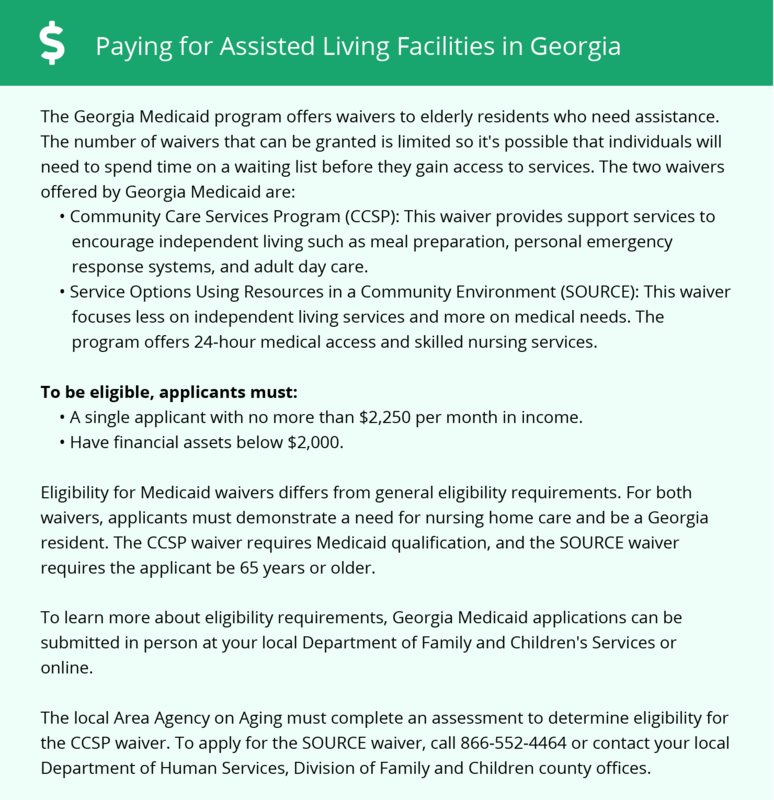 There are two Medicaid waiver programs administered by the state to help seniors pay for assisted living facilities in Monroe: the Community Care Service Program (CCSP) and Service Options Using Resources in a Community Environment (SOURCE). Both programs are subject to availability. To see a list of free assisted living resources in Monroe, please visit our Assisted Living in Georgia page. Monroe-area assisted living communities must adhere to the comprehensive set of state laws and regulations that all assisted living communities in Georgia are required to follow. Visit our Assisted Living in Georgia page for more information about these laws.